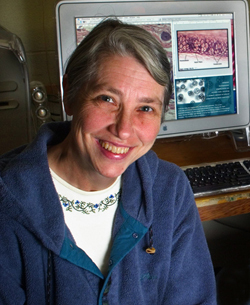 The 2011 Victor Hamburger Outstanding Educator Prize was awarded to Mary S. Tyler for her dedication to developmental biology education. Tyler, a professor at the University of Maine, pioneered digital media for developmental biology instruction with Fly Cycle, Vade Mecum, and Differential Expressions: Key Experiments in Developmental Biology, an invaluable collection of short movies about scientists who have contributed greatly to the field of developmental biology. The Society for Developmental Biology Professional Development and Education Committee selected Tyler to recognize her excellence in teaching. She has made developmental biology education her life’s work. Tyler first caught the developmental biology bug as an undergraduate student at Swarthmore College. “The first time I saw a movie of an amphibian egg undergoing its first cell cleavage, I was hooked,” she said. “...I really felt fireworks going off in my head. I could not get enough of this subject.” From that moment on there was never any doubt about her pursuing a career in developmental biology, she said. Tyler did her graduate work at the University of North Carolina earning her Master’s degree under Gene Lehman in 1973 and her doctorate in 1975 with Bill Koch. She studied the interactions between the epithelium and mesenchyme in the developing mouse secondary palate. Upon graduation in 1975, Tyler did a postdoc as an NSF-NATO Postdoctoral Fellow at Dalhousie University in Nova Scotia, Canada with Brian Hall. In 1976, she joined the faculty at the University of Maine where she was able to thrive. “...I could just be myself and develop in my career without having to look nice and wear proper shoes and I could go home and cut wood,” she said. During the early part of her career Tyler studied various aspects of craniofacial development. However, by the early 1990s her focus shifted to creating educational products, in particular, developmental biology educational materials to help support her teaching. (2) Science is a verb—you must do science to learn science. (3) Study your organism and learn from your organism. It is telling you something—listen. Since the initial release of Tyler’s film, Fly Cycle: The Lives of a Fly, Drosophila melanogaster, in 1996, it has been updated in Fly Cycle2 (2003) which in a rare review of a movie by a journal was given “two thumbs up” in Development. In addition to the DVD, Tyler has online content that includes life cycle descriptions and laboratory exercises. In fact, Tyler’s collection of interviews with influential developmental biologists, Differential Expressions: Key Experiments in Developmental Biology, came out of a collaboration with Gilbert. “He had already hatched this idea that he would go around interviewing very prominent developmental biologists and then make an archive so that their wise words were never lost. And he talked to me about it and I said, ‘Oh yes, I think I can help you.’” Tyler was able to take these interviews with such greats as Nicole Le Douarin, Lauri Saxén, and Jay Lash, and place them in a historical context. In a climate where institutions are eliminating labs to save money, Tyler has created labs that cost very little money. “No one can say to me, ‘We don’t have enough money to teach labs.’...You have enough money. You’ve got two dollars per student,” she said.